After much passionate collaborative work, Cinco Jotas has launched it’s websites for the US (Cinco Jotas US), UK (Cinco Jotas UK), France (Cinco Jotas France), and globally (Cinco Jotas Global). Aside from overseeing all the translation work, Bannigan Communications is also contributing to the content, and providing guidance on their blogs. See below a recent blog post, which invites you to explore the secrets of the brand. Enjoy! The Cinco Jotas brand is much more than the most exclusive ham in the world: it is the story of generations who have lived in harmony with nature for centuries. Our team creates something sublime from 100% Iberian pigs, crafting ham that has a perfect balance of flavour, texture and aroma. Thanks to this unique and distinguished breed, Cinco Jotas is Spain’s national treasure. The secrets of this supreme Iberian meat are hidden in the idyllic setting that has been the home of the Iberian pig for hundreds of years. The centuries-old meadows of south-west Spain are an unparalleled setting in which man and nature have coexisted in perfect harmony for generations, helping to preserve the stunning nature reserve that produces the main sustenance of the ibérico pig: the acorn. It is this delicate, nuanced process which explains why 100% Iberian meat is unrivalled in gourmet circles. 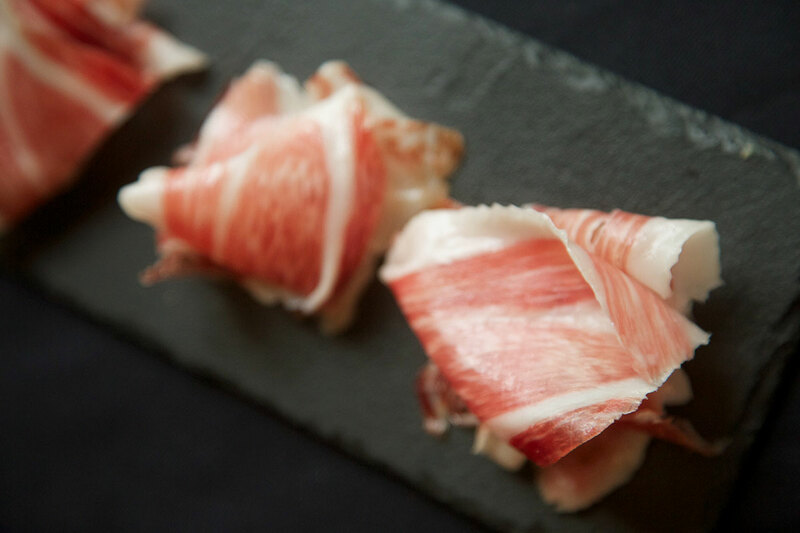 The acorn is responsible for the jamon’s notes, flavours and textures that seduce even the most discerning of palates. Iberian meat deliciously captures all five senses. The heart of our history. Achieving perfection is not easy and requires more than mere expertise to raise and care for our incomparable indigenous breed. 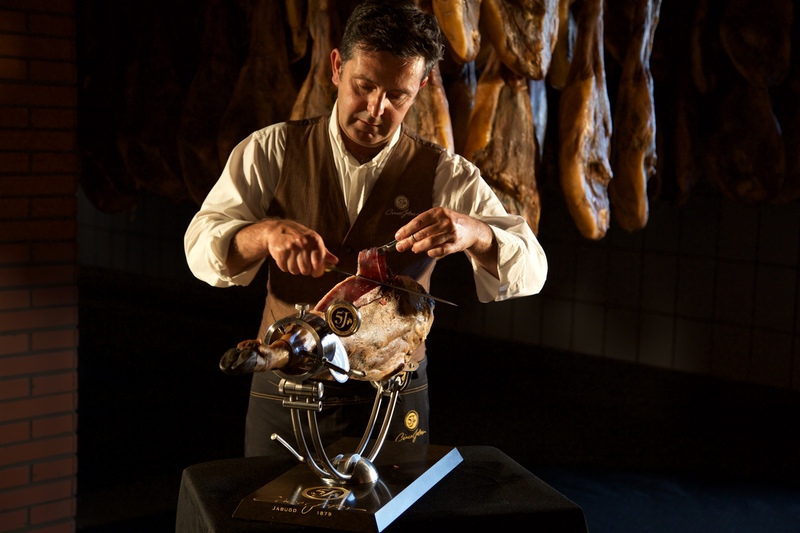 Beyond care of animals, the effort that our expert artisans put into the detailed process of making every distinct piece of ham is part of the legend, just like the curing cellars that have been part of our history since 1879. These exquisite locations maintain a unique atmosphere, a perfect balance between humidity and temperature. Our curing cellars in Jabugo are the perfect place for the meat to reach its maximum potential. Cinco Jotas has expert artisans who excel in each phase of ham development to ensure the highest quality of Cinco Jotas products. 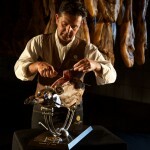 Each Cinco Jotas Iberian product that leaves our curing cellars stands out for its taste and quality. The exquisiteness of Iberian meat is one of the best -kept secrets of Spanish gastronomy and the most authentic gift from Spain. 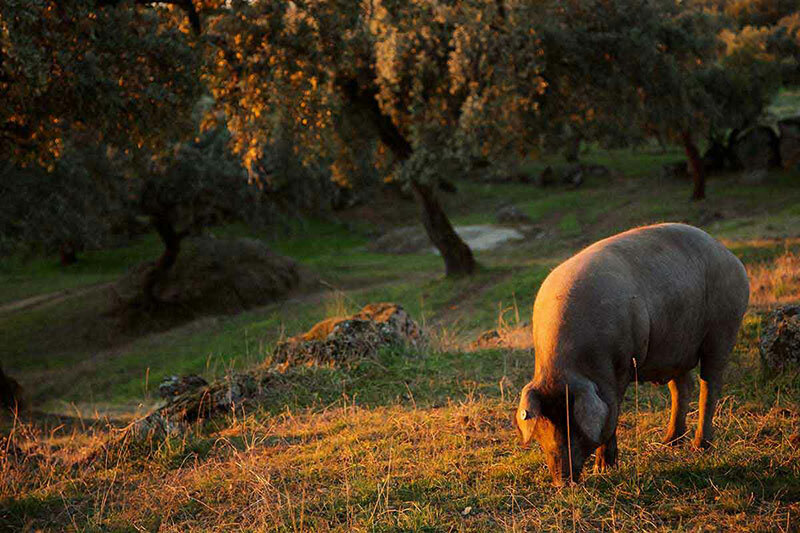 The flavour releases unrivalled sensory experiences and transports you to the dehesas (Spanish meadows), home of the most exalted pig breed in the world. Iberian meat also has proven health benefits. The fats of Iberian pigs contain more than 54% oleic acid that has a beneficial effect on our health, helping to prevent cardiovascular diseases. All products from this breed are completely natural and are recommended for regular consumption; as they provide essential vitamins, minerals and antioxidants. Precisely because of this, Cinco Jotas Iberian products are the star ingredient in exclusive recipes prepared by the most prestigious chefs in Spain and around the world.